Published in the South Kent Gazette, 20 June, 1979. FORGE OF THE 14th CENTURY. The most ancient structure which history mentions as having existed on the eastern side of the Market Place was a forge — the forge of William of Kenartone. The fact is perpetuated by a record of the Dover Hundred Court — or, as it is written, “the Court of the Lord the King held in Dover on the Friday next after the Feast of St. Mark the Evangelist, in the sixteenth year of the reign of King Edward III.“ It is probable that Kenartone and his forge would long ago have passed into oblivion but for the fact that the rent was allowed to fall into arrears. It was not Kenartone the smith who was in default, for he was but an under-tenant. It was John Kemp who held over him, who had omitted to pay William Gibbe (jun.) and Margaret his wife the annual rent for this forge, which consisted of two shillings and sixpence and one hen. When the case came before John Monin, the Mayor, and others of the King’s lieges, there was no defence, and it was decreed that this half-crown and one hen should be paid as perpetual rent by Kemp to Gibbe and his heirs or assigns against all men for ever. That rent and its receivers have long since passed into the realm of things forgotten, but the document signed and sealed in the Dover Court on St. Mark’s Day, 1342, is still extant, and bears witness to the very spot where the forge of William of Kenartone stood “abuting on the lands of William Hortin, to the North East (Castle Street way), the King's Highway to the South West (towards the sea), bordering the King’s Highway to the South East (Dolphin Lane), and the Cemetery of the Church of the Blessed Peter to the North West.“ These boundaries are interesting because they inform us where the lands of William Hortin, who was the King's Bailiff, lay at that time, and also the whereabouts of the ancient cemetery which was probably the first regular place of Christian burial in Dover. There is no forge on the eastern side of the Market Place today, but there used to be not far from Kenartone’s forge a building known as “Tinker’s Hall.“ Tinker’s Hall was a later development, and it is possible that when the east side of King Street was an open quay abutting on the tidal river, the trade of ship repairing was carried on here. Tinker’s Hall and Tinker’s Tower were terms applicable to the same building, and it is possible that the artificers who kept the King’s ship in repair at Dover had their quarters there in the later Plantagenet days. The eastern side of the Market Square is left without historic note relating to the interesting period of the Reformation, but in the Elizabethan days houses were built immediately adjoining the southern side of Dolphin Lane. There was a re-building there in 1889 of a wine merchant's shop, but, prior to that time, the house standing there was ancient, and had a fine river frontage looking towards the Castle, and the grounds of the house covered the site of the old brewery over the river. It was on the southern half of these premises that Mr. Mate, at the beginning of the last century, had his printing office — an office where were printed the military orders when Wellington was getting together his forces to give Napoleon his quietus at Waterloo. 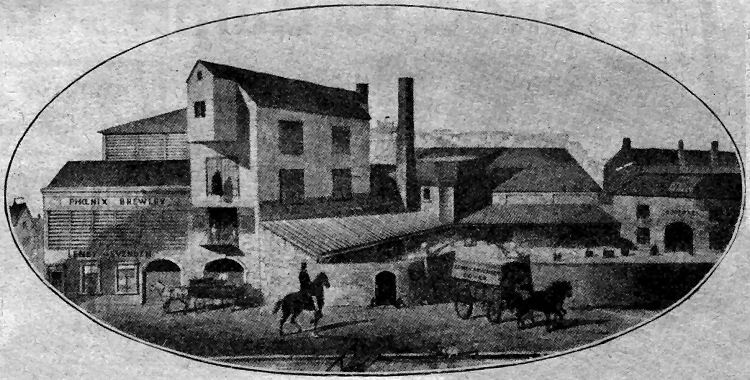 THE old Phoenix Brewery, which spanned the land between Castle Street and Townwall Street. Founded about 1740 by a Mr. Clements it became a flourishing concern in the early 1800s under the ownership of Mr. James Walker and was further expanded by Mr. Alfred Leney who took over the business, complete with 30 “ tied houses,“ in 1859, from the executors of Thomas Walker. The name Leney is linked in the above picture, said to be of the original brewery, with that of Evenden. In the foreground is a glimpse of the River Dour with a footbridge over it. It is a matter of interest that this eastern side sheltered the germ of our Royal Victoria Dover Hospital in the pre-Victorian days. The Hospital was in the first instance a Dispensary only, having been under the patronage of the Earl of Liverpool in 1823, and subsequently lapsed. It was revived in 1828, and located on the east side of the Market Square, the exact spot being where Flashman’s had their furnishing business. Today a supermarket occupies the site. Mr. George Flashman, who had a furniture depot in Last Lane, set up his upholstery business in the Square, at the time the dispensary was revived and it continued to do business there until re-development in the 1960s. Next to him was Richard Harding, the dyer, and Mr. Gorely, the hatter, adjoining Dolphin Lane. There was a passage then between Harding’s and Flashman’s premises, and up this passage was located the room where the Dover Dispensary carried on its good work in the year 1828. The Secretary then was Lieut. R. Mudge! the Dispenser, Mr. C. Podevin; and the Medical Staff, Dr. S. Stolterfoth, and the Surgeons, Messrs. S. Chalk, Norwood, W. Robinson, T. Coleman, and E. Sibbett. The Dispensary did not long remain in the Market Square, and it afterwards sojourned awhile in Snargate Street and in Queen Street before settling on its present site in High Street. The opening of Castle Street made a great change in the eastern side of the Market Square. It removed the Antwerp Stables, which stood right across the northeast angle, and were no ornament to that spot. After Castle Street was opened in 1836, Flashman’s extended their showrooms up that street and Harding, the dyer, whose premises were between Flashman’s and Killick’s, was squeezed out. A view of the eastern side of the Market Place, as it was about the year 1822, is given in the reproduction of the remarkable detailed and coloured drawing of J. E. Youden, below. A glimpse of Flashman’s corner as it appeared before rebuilding was given in the undated print, which also appears in this chapter, depicting the view up the newly opened-up Castle Street as seen from under the arches of the old Guildhall. Through the central arch the distant view of the Castle, in spite of the flight of years, is wonderfully like what we see today from the centre of the Market Square. The south side of the Market Square is now a picturesque admixture of ancient and modem frontages. Turning to the very early historic records, we find nothing more definite than the general statement that the Canons of St. Martin had their dormitories, kitchens, and other apartments on this side of the Square. It is not to be inferred from that, however, that they occupied the present frontage; the fact, as far as it can be ascertained, being that the buildings in question covered a large area in that direction, some being on the west side of King Street, and others extending as far as the south side of Bench Street, including the lower side of Last Lane; and that the old building, formerly the Seamen’s Hospital, that stood at the Queen Street comer of Market Lane, was a portion of the property of the Canons. 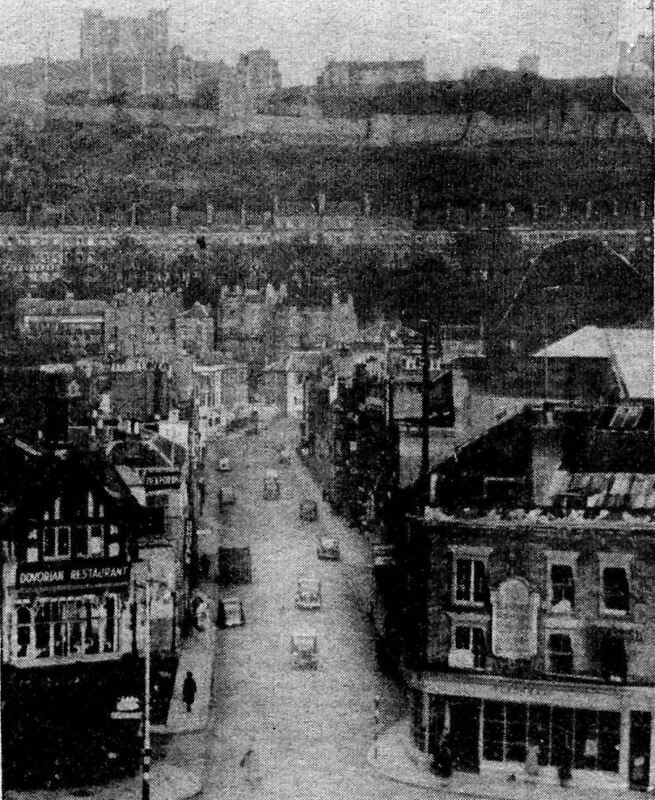 Featured in the above picture is a view up Castle Street between Igglesden’s Dovorian Restaurant and bakery business and Flashman’s furniture showrooms on the opposite corner.